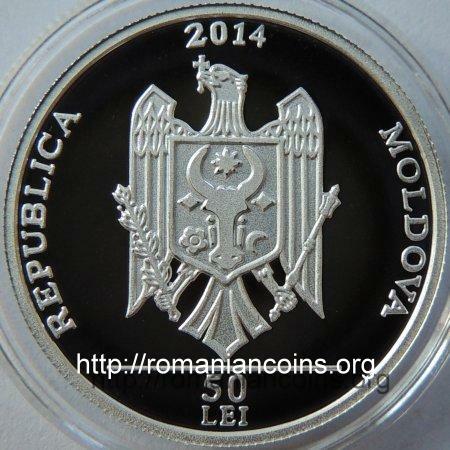 year 2014, circular inscription REPUBLICA MOLDOVA meaning "REPUBLIC OF MOLDAVIA" and the coat of arms of the Republic of Moldavia, in exergue horizontal line and denomination "50 LEI" an image of the monument on the bank of Nistru River, valley of Nistru River seen from upstream, inscription "LUMÎNAREA RECUNOŞTINŢEI" meaning "CANDLE OF GRATITUDE"
The coin belongs to Monuments of Moldova series. The Candle of Gratitude is the name of candle-shaped chapel of 29.5 meters in height. 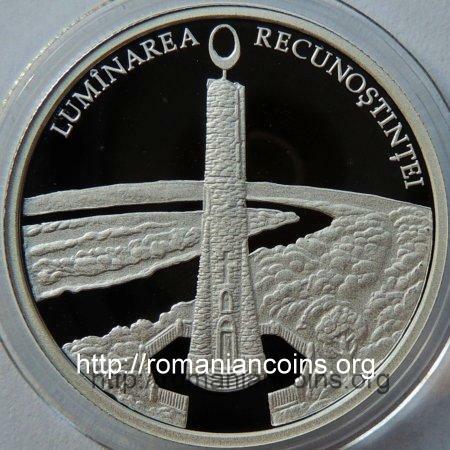 The monument is atop a hill close to Soroca, on the bank of River Nistru. In order to reach the chapel starting from the base at the water level, 600 steps have to be climbed. The idea to buid this monument belonged to writer Ion Druţă. The chapel is dedicated to the Moldavia's monuments that did not last over to the present (due to the vicissitudes of the past), to all who, across the history, have contributed to the preservation of national language and culture, as well as to the anonymous poets who have created and preserved the Mioriţa Ballad. The monument was inaugurated 10 years earlier, in 2004, on March 27th. 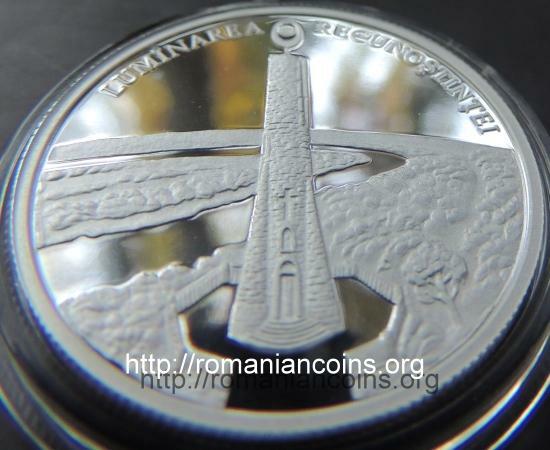 The choice for this day was made so as to coincide with another important date, namely with March 27th 1918 when the Council of the Land (Sfatul Ţării) voted the Union of Basarabia with the MotherLand, Romania.